People who use the internet regularly don’t know how they’d live without it. They wouldn’t know how to find the latest sports scores, or make an airline reservation, or compare reviews of consumer products. They couldn’t order books without Amazon, buy music without iTunes or keep in touch without social media. It’s not that being a senior means you can’t adapt; you have adapted all your life. Telephones went from rotary dial to mobile; railroads gave way to the interstate system and then to air travel. There didn’t used to be things like ATMs, microwave ovens or DVDs either, but chances are you’ve survived – and thrived – using all of them. But computers and the internet made things both easier and more difficult. Sure, you say, I could download music on a computer, but I could also inadvertently download a virus. I could keep in touch with email, but I get tired of spam. I hear about identity theft all the time. And I’m always afraid I’ll do something wrong on my computer – or that I’ll need to call my children or grandchildren to help me work through a problem. These are all valid complaints. 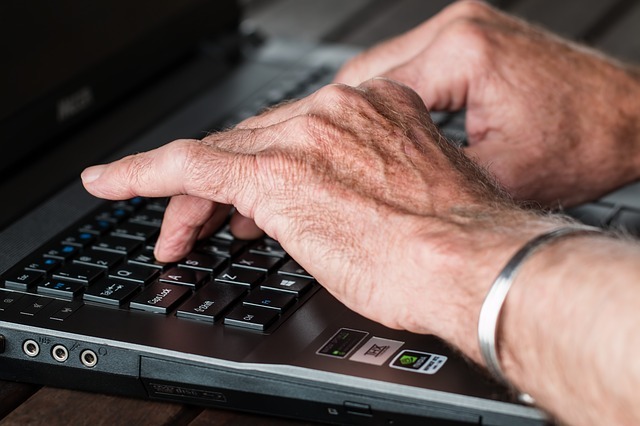 But the online world is here to stay, and seniors who can’t access it risk being left out. Newspapers now update their online sites first. Consumer products often cost less online. When you miss out on Facebook, you miss out on finding that old classmate, or seeing the pictures of your grandchildren that your children constantly post. And if you’re a genealogy buff, you’d be happy to find the many sites that help you trace your family tree in detail. So how do you approach what seems to be a tangle of jargon, equipment and expense? Think of a computer as a typewriter connected to a screen that’s connected to the world. Anything that’s available in the world, you can use your keyboard to find it and bring it to your screen. It’s just a matter of learning some simple commands and finding the things that will make it easier for you. If it helps you to start with a book, do that. You can probably find these at your library or local bookstore if you aren’t adept yet at Amazon.com. The “Dummies” series of books is terrific, and there’s one for this: Computers for Seniors for Dummies by Nancy C. Muir. The “Idiots” gudes are similar: The Complete Idiot’s Guide to Using Your Computer – For Seniors by Paul McFedries. There are also guides to software – which is what runs your computer programs – and books and magazines that are written to help you with your Mac or PC, your iPhone or Android phone, your iPad or tablet. Type size: Did you know that you can adjust the type size on most computers? On PCs, it can be done by holding down the Control button while rolling the wheel on the mouse. In Apple computers, you press the Apple and J keys together, which brings up a box that lets you increase the text size. And if the text on your keyboard itself is too hard to read, there are large-print keyboards or large-print keyboard stickers you can buy. Tablets: In some ways, a tablet may be easier to learn than a computer, and it gives you access to many of the functions you may find most important: email, calendars, the ability to see digital photos, social media, internet access, and popular apps that range from games to brain exercises to retail stores. Tablets are touch-screen, which means simplicity (though some come with keyboards if desired). Almost every computer or mobile phone company makes its own tablet now; a few popular ones are Apple’s iPad, Microsoft’s Surface, Samsung’s Galaxy, Google’s Pixel and Amazon’s Fire and Kindle. Cnet.com, a reliable consumer technology site, reviewed the best of 2016 and ranked several tablets of varying price points. AARP has a tablet, too: the RealPad, which comes with instructional videos and access to a 24/7 live help line. And a computer just for seniors: The Wow! computer people made it their business to design a computer that irons out many of the problems seniors have with technology. The screen is large, and it’s a touch screen (though you also have a keyboard). You never lose your place on the screen because the main menu stays visible down the side at all times (menu options are Home, Video Chat, Email, Photos, Calendar, Contacts, Weather, News, Web and Games). The computer is pre-loaded with software, including anti-virus software. It also has instructional videos and a live support line. Take a step. And then another, and then another. It won’t be as hard as you think. And when you’re ready, you can email us at customerservice@firstSTREETonline.com.